A sudden gust of wind swirled against the RiverClan deputy. Having been caught unexpected, Scorchclaw folded his dark ears in discomfort. With the eclipse Lichenmask had caused came a sudden drop of temperature. Even through his thick tabby pelt, he could feel the chill in the air. Perhaps it was due to the lack of sunlight, but leaf bare seemed to have arrived sooner than expected. Ducking into the warmer confines of the Apprentice Den, Scorchclaw exhaled softly. Carefully, he made his way to Sleekpaw's nest. 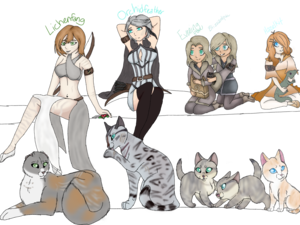 Eclipse or not, life for RiverClan's apprentices still went on. No--it was precisely because of Lichenmask's threat that they could not slacken in training. "Sleekpaw," Speaking as loudly as possible without waking the other apprentices, he shook the young she-cat awake, "get up. Training." With those few words, he headed back outside. Taking a seat by the entrance to the Apprentice Den, Scorchclaw waited for Sleekpaw's emergence. Sleekpaw was sleeping about as peacefully as she could. up until she heard a voice and her eyes opened quietlt. Not waiting to be told twice not like they would anyhow she got to her paws and slowly followed her mentor to the entrance fiving her fur a small shaking and stretched slightly before she stood tall. Before a few minutes had even passed, Sleekpaw stepped out of the Apprentice Den. Despite the fact that she had been fast asleep a moment ago, she looked fairly alert. Scorchclaw greeted her with a nod. Using the dark tip of his tail, he pointed towards the fresh-kill pile. "Get something to eat." He instructed, "Then we'll head out." The camp was slowly rousing itself from the sticky grip of sleep. An overexcited kit was making a commotion in the nursery, their squeaks carrying quite clearly through the cold air. It was much too early for this. In response, the brown tabby flicked an ear. He had already organized the dawn patrol. Hopefully, they would return with enough prey to fill the bellies of their clanmates, who were ravenous after a night. Sleekpaw smiled and gave a brisk nod. The brown and ginger she cat moved to the fresh kill pile grabbing her a small fish and sat down eating on it quietly. Finishing it she quickly padded over"okay let's go"she mewed. When the young she-cat had finished her meal, Scorchclaw got to his paws. "This will be your first time leaving the camp, so stay close to me." He instructed her, a serious gleam in his green eyes. Striding towards the camp exit, a shallow stream soon came into view. As each clan had its own unique camp, RiverClan'swas set on an island. The stream was a natural, effective defense towards the other clans who could not stand water. While he had used the term "shallow," it could still pose a challenge for a newly-appointed apprentice. He waded in until the waves lapped at his chest fur before looking back. When he was certain that the apprentice could cross without incident, he splashed on. On the shore, he shook out his thick pelt. Onward they trod. When they had walked for quite a distance, the large tabby guided Sleekpaw to a riverbank. "This will do." He announced with a satisfied nod. "I will be teaching you to swim today. If we still have time after covering the basics, we'll do some battle training." He had deliberately avoided the main river, knowing its strong current to be too dangerous for a beginner. Fortunately, dozens of smaller waterways ran through the wetlands--the veins and arteries of RiverClan territory. Beckoning Sleekpaw forward with his tail, he pointed his maw to the shallows. "Let's get started. How are you with water? Have you gotten used to it yet? As a RiverClan cat, it is essential that you learn to be comfortable in the water." 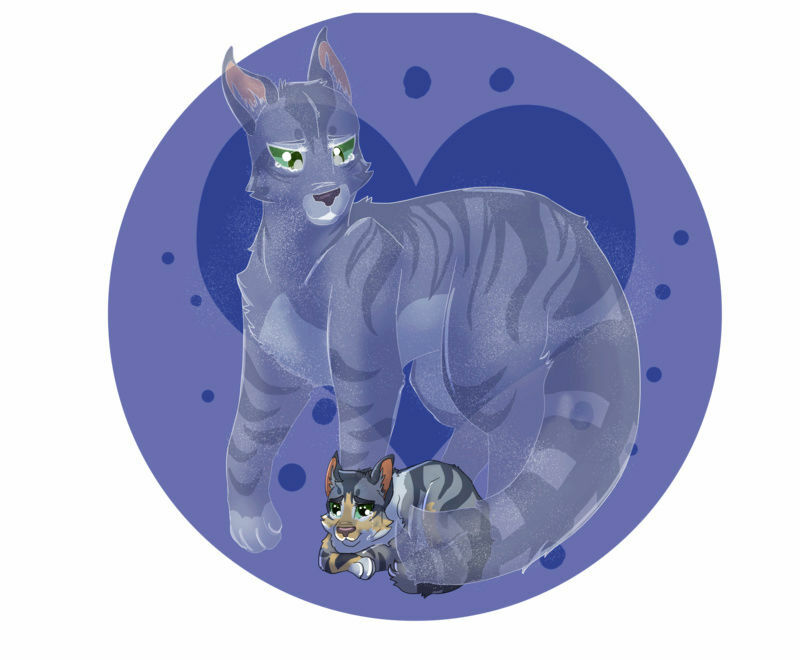 Sleekpaw followed after her mentor quietly and eagerly the apprentice quiet at least for the moment. When her mentor asled her if she had gotten used to the water she had fallen quiet"yes I have"She mewed after a pause. She hoped they could get through the swimming portion to get to the battle training. "Good." Scorchclaw mewed. "Watch me closely. I'll demonstrate the technique, and you'll try to copy it. For a better view, try to open your eyes in the water." Leaving the apprentice in the shallows, the fluffy deputy waded further into the river. At a certain point, the water's depths grew greater than he was tall. He kicked out with his legs, strong strokes keeping him afloat. With a glance to ensure that Sleekpaw was watching, he proceeded to swim back and forth before her. His large, tabby form glided smoothly through the water, leaving a trail of ripples behind. At length, he headed back to Sleekpaw's side. "It's your turn now. Keep your head above the water. If anything happens, don't panic, and I'll come pull you out." Water dripped freely from off his pelt. Scorchclaw didn't bother to shake himself dry; they were still in the middle of swimming practice.